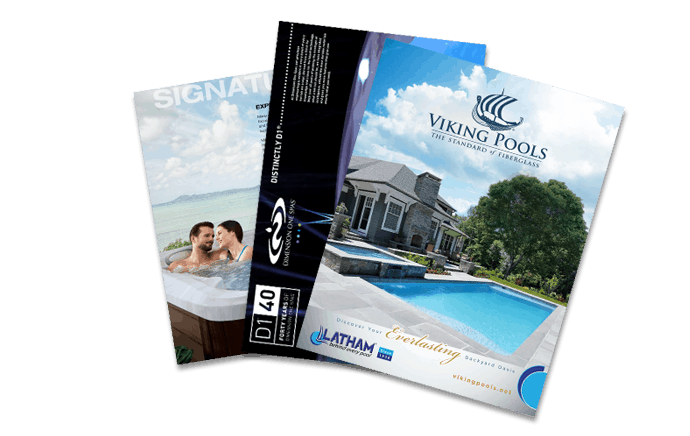 Aqua Pools partners with Latham vinyl liners, which offers an impressive selection of vinyl liners. In terms of style, there are three collections, and the only consideration for choosing is your own personal preference. You can also select the thickness of your vinyl liner, which allows you to tailor your vinyl liner to the particular considerations of your pool (such as durability in extreme weather or added thickness on the stairs). Lighter-colored pool liners tend to create a feeling of serenity. Hailing from the iconic images of the Caribbean, the light collection delivers a subtle, soothing palette of colors inspired by the light blue waters of the islands. Many customers prefer to avoid the extremes – opting instead for balance and harmony. That’s the inspiration behind our medium collection of pool liners. Goldilocks would like our medium collection, because it isn’t too light, and it isn’t too dark. It’s juuuuust right. Dark liners are dramatic and impactful. The dark liner collection delivers sophistication and style to your landscape. As in the ocean, deep blues and other hues are bold, powerful, and oh so beautiful. If you’re looking to make a statement, dark vinyl liners do exactly that. After you’ve selected the collection that best fits your sense of style, you’re ready to take a look at your options for vinyl thickness to ensure that you have the best suited material for your specific pool application.